Few people in the UK can recognise Japanese knotweed, described by the Environment Agency as the most destructive, aggressive and invasive plant in the country, but a court ruling means that home owners can sue their neighbours if it ends up on their land. New research has found that just 19% of people who say they are aware of Japanese knotweed can identify the plant. They survey, commissioned by Environet, a firm that specialises in removing it highlights a widespread lack of knowledge which experts say is leaving home owners are risk. The study asked people to pick out Japanese knotweed from a selection of five photographs. Some 81% were unable to correctly identify it, with 14% mistaking it for bindweed, 8% selecting houttuynia, 5% Russian vine and 6% confusing knotweed with common ivy, found in most British gardens. The results of the survey come at the same time as a landmark court ruling in favour of two home owners in Wales who sued after Japanese knotweed spread into their gardens from Network Rail. The court decided that Japanese knotweed is a ‘nuisance’ and ‘natural hazard’ that land owners must keep under control. Each man was awarded £15,000 in damages. The Residential Landlords Association (RLA) has warned landlords to keep a look out for the plant as they cannot rely on tenants being able to identify it. According to Environet a failure to identify and treat Japanese knotweed as soon as it appears will result in it quickly spreading and becoming established. It can damage buildings and render them unsellable until a treatment plan is implemented and now it can leave home owners at risk of litigation from neighbours, if they allow the knotweed to spread. It is also an offence to try to hide the presence of Japanese knotweed if you are selling a property. There is a requirement to disclose its presence on the Law Society’s TA6 form. Based on the fact that an estimated 2% of properties in the UK are directly affected by knotweed, this could result in approximately 1,000 cases each year of knotweed concealment during property transactions, according to Environet. 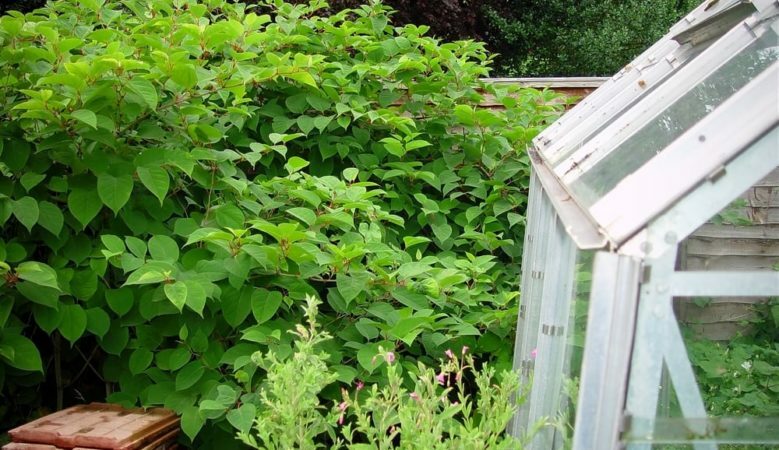 ‘Most people have heard of Japanese knotweed but the fact that only 19% of people in the UK can identify it from other common plants such as bindweed and ivy, is very concerning,’ said Nic Seal, managing director of Environet. He explained that if left untreated Japanese knotweed will grow rapidly, by up to 10cm a day during the summer months, pushing up through cracks in concrete, cavity walls and drains and causing damage to property. The longer it is left, the further its underground root system will spread and the more costly it will be to tackle. ‘Iit’s not just about protecting one’s property from damage and decreased value, it is also about protecting oneself from the risk of being sued if the knotweed is allowed to spread. The good news is that Japanese knotweed can be treated, either over two to three years using herbicide methods, or immediately by excavating it from the ground,’ he pointed out. ‘With an insurance backed guarantee secured for the work, most High Street mortgage lenders will be happy to lend against an affected property, meaning it can still be bought and sold,’ he added. Professional treatment is the most effective way to manage and control Japanese knotweed, according to chartered surveyor Philip Santo, director at Philip Santo & Co. ‘DIY treatments can make matters worse and the financial consequences of concealing or not declaring the presence of Japanese knotweed during a sale can easily run into tens of thousands of pounds, so it is just not worth taking the risk,’ he said. In the landmark legal case Stephen Williams and Robin Waistell, who own two adjoining bungalows in Maesteg, south Wales, made a claim against Network Rail, which owns the land immediately behind their properties. They first complained about the plant spreading in 2013 and brought a successful claim against Network Rail at Cardiff county court and were awarded damages in February last year. However, Network Rail challenged that decision, but now the Court of Appeal has ruled that the home owners were entitled to damages because the plant’s rhizomes had extended beneath both of their properties. The judges, Sir Terence Etherton, the master of the rolls, Lady Justice Sharp and Lord Justice Leggatt said that Japanese knotweed, and its roots and rhizomes, carries the risk of future physical damage to buildings, structures and installations on the land. They also said that its presence imposes an immediate burden on land owners who face an increased difficulty in their ability to develop, and in the cost of developing, their land, should they wish to do so, because of the difficulties and expense of eradicating Japanese knotweed from affected land. ‘Japanese knotweed can fairly be described as a natural hazard which affects land owners’ ability fully to use and enjoy their property and, in doing so, interferes with the land’s amenity value,’ the ruling said, but they added that home owners would not be entitled to seek damages on the grounds that the knotweed had reduced the value of their properties.